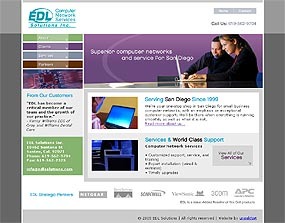 EDL Solutions is a new Information Technology firm in San Diego..
Our team created a very simple site reflecting EDL's exceptional, quality customer service in the field of small business computer networking. "uneekNet has done a fantastic job designing our website. Mike Atkinson was very accommodating in working with my specific ideas. He enhanced them and created a website that is professional and very appealing to the eye. uneekNet is always available to make changes and updates and does so with incredible promptness. We have had extremely positive results and feedback from our clients."